Emma Pickering continues her fantastic run of form of late having now confirmed a place in this year’s Feeder Masters final! Having recently been confirmed as part of the England Ladies team flying out to Poland for this year’s World Championships, Emma topped her twenty (20) man zone as part of qualifier number eight of this popular feeder-only event held at Southfield Reservoir – a venue she has been spending a lot of time at recently. 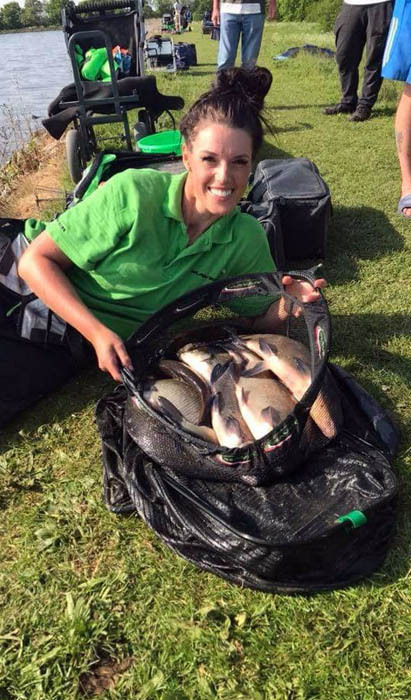 Emma’s latest result at the venue will now see her compete in September’s Feeder Masters big money two-day final, which will reward the eventual winner with a massive £12,000. Below, Emma looks back on another superb result. Emma will now fish September’s final at Bough Beech Reservoir on 22nd & 23rd. “The latest Feeder Masters qualifier saw me travel to Southfield Reservoir. The event was a sellout with sixty (60) anglers split into three zones, with the winner of each going through to the final“. “I drew peg 65, which was towards the far end of the reservoir. Looking back on the results from the previous day on the team event, they suggested it had been hard at this end of the lake if the weights were anything to go by, but I still felt positive I’d have a few bites“. “I set up in the water, got myself comfortable and then just took a minute to look and see what lines people were clipping up on. I went to my peg with an idea of how I wanted to approach the match, but with the team event the previous day and speaking to Lee who had been on my peg the previous day, I decided changed my plan a little to suit“. “I set up three rods to fish three separate lines with a different approach on all of them; one at eighteen (18) metres, one at thirty (30) metres and the third at fifty (50) metres. At eighteen (18) metres, I set up my 10′ 6″ Diamond rod with an 0.12mm hook length to a size 16 hook. For the thirty (30) metre line I opted to set up my Diamond 12′ rod with a 0.14mm hook length to a size 16 hook. For my last line at fifty (50) metres, I set my 12′ 8″ Diamond ro up with a 0.14mm hook length and a size 14 hook. All of my rods were using a brand new hook pattern we’ve been testing of late and, I have to say, I have been left very impressed“. “At the all in, I fed my two short lines and then chucked long to allow these lines to settle and give the fish chance to come over and feel confident to stay in the peg“. “I decided to alternate between worm and maggot on the hook as I have found experimenting with hookbaits often brings a quicker response rather than constantly chucking the same bait over the top each cast. Eight (8) minutes into my first cast produced a skimmer around a pound and a half followed by another eight (8) fish in the two and a half hours that followed. Quantity wise, I felt I was right up there, but my fish seemed a smaller stamp to others around me“. “At this point in the match, I put my long rod down and went on my shorter lines and, straight away, found a few good fish including two stunning hybrids that tried their best to get away“. “With an hour to go, I had fourteen (14) fish, but knew I needed a couple more to be in with a chance. Patience paid off and I ended with four (4) more fish inside the last twenty minutes. Two of which came in the last seven minutes and were the two biggest of the day“. “At the all out I had eighteen (18) fish, which i felt might go 25lb. The scales arrived and my fish went 28lb 10oz, which to my delight, topped the zone and saw me through to the prestigious final in September at Bough Beech. An emotional phone call to my dad and Sean to tell them I had qualified followed. I just couldn’t believe it. The calibre of angler fishing this event makes me so proud to have gotten through and my hard work and patience during the day paid dividends“. PreviousPrevious post:Match This Qualifier no. 10 – The GlebeNextNext post:Dave’s Going Down Under!